Each cell contains four principal biomolecules, namely: carbohydrates, nucleic acids, proteins and lipids. The latter encompasses a broad class of molecules that are typically soluble in non-polar solvents but not in water and include fatty acids, sterols, glycerides (mono, di and tri) and phospholipids. Phospholipids are the primary building blocks of all biological membranes (top panel of figure 1 adapted from 1) that assemble non-covalently into sheet-like structures made up of two leaflets. These molecules are characterized by a hydrophobic tail that is linked to a hydrophilic head. The tail comprises two long, non-polar fatty acyl groups, while the head is made up of a small polar group that includes a phosphate (figure 1 center panel). A biological membrane consists mainly of phosphoglycerides. A typical phosphoglyceride is shown in the center panel of figure 1. Although phospholipids are crucial for generating a classic bilayer, most membranes also contain other lipids. The mammalian cell membrane, for example, is rich in cholesterol in addition to phospholipids. Cholesterol and its derivatives are related compounds known as steroids with a structural core made up of fused four rings (figure 1 bottom panel), three of which have six carbons and one that has five. Cholesterol contains a hydroxyl group on one ring and like other lipids, it is amphiphilic due to its hydrophobic hydrocarbon nucleus and hydrophilic hydroxyl headgroup (2). 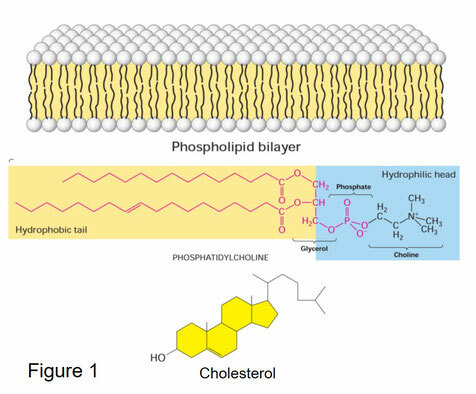 Cholesterol is a rigid and almost planar molecule and owing to these features it is in bilayers intercalated among phopsholipds, thereby restricting the random movements of phospholipid headgroups at the outer surfaces of the membrane leaflets. Thus, cholesterol is a crucial structural component of membranes because it controls their organization and maintains their fluidity. Additionally, cholesterol serves as precursor for steroid hormones, bile acids and fat-soluble vitamins and it modulates the function of receptors involved in vesicle trafficking (2). Cholesterol is, moreover, associated with cardiovascular diseases that are considered as globally one of the leading causes of death (3). Insight into the biosynthesis of cholesterol is, therefore, crucial to develop new drugs for controlling circulatory levels of cholesterol. The biosynthesis of cholesterol is complex process, requiring about 20 different enzymes that are tightly controlled at several points (2). The first steps of cholesterol synthesis are performed in the cytosol, while the last steps are catalyzed by enzymes that are bound to the endoplasmic membrane. For example, squalene monooxygenase (SQLE) is bound to the ER membrane and catalyzes the stereospecific conversion of squalene, a non-sterol intermediate, into 2,3-oxidosqualene (4). This is the first oxygenation step in the cholesterol biosynthesis and represents an epoxidation reaction. SQLE is a flavin-dependent monooxygenase that requires NADPH and oxygen to oxidize squalene (5). Moreover, SQLE has emerged as an attractive drug target for antifungal compounds and accumulating evidence indicates a role as oncogene in cancer progression and aggressiveness in humans (6). 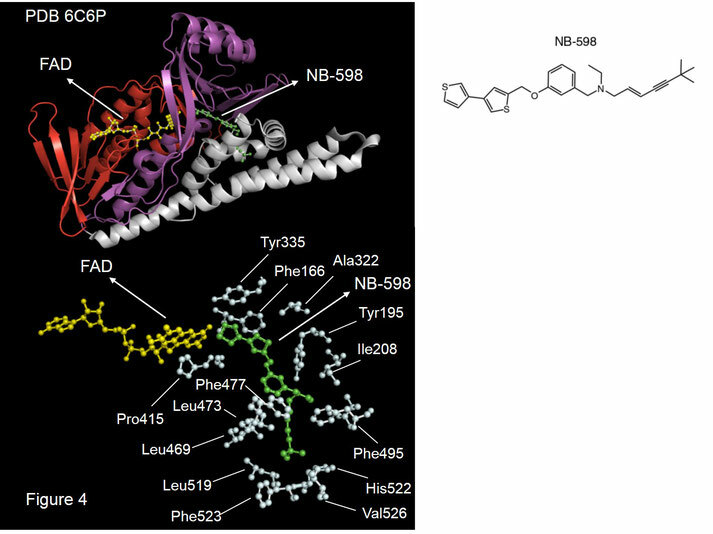 Recently, high resolution structures of human SQLE have been reported providing molecular insight into its catalytic mechanism and opening new avenues in the design of novel inhibitors (7). Here, I will discuss these structures as well as our current mechanistic understanding of this enzyme. Cholesterol and its derivatives are known as sterols and in fact cholesterol is the major sterol in animal tissues. Sterols are characterized by a conjugated system made up of four fused rings of which three have six carbons and a fourth that has five. This ring system ensures that structurally sterol molecules are almost planar and rigid. Cholesterol, moreover, contains a hydroxyl group that is attached to one ring that is equivalent to the polar head group of other lipids, while the ring system and short hydrocarbon chain comprise the hydrophobic tail. Thus, like other lipids, cholesterol is amphiphilic and is therefore a key component of cell membranes. As membrane lipid, cholesterol is important for the structural organization of the lipid bilayer, whereas it also serves as precursor for steroid hormones, bile acids and fat-soluble vitamins and it modulates the function of receptors involved in vesicle trafficking. Despite its association with cardiovascular diseases, cholesterol should not be viewed as a bad molecule because life would not be possible without this molecule. Cholesterol can either be obtained from food or synthesized de novo. The biosynthesis of cholesterol requires about 20 enzymes of which some are located in the cytosol and others in the endoplasmic membrane (2). Figure 2 shows the complete cholesterol biosynthesis (adapted from 2). The first steps occur in the cytosol and comprise the formation of mevalonate from acetate through sequential condensation of acetyl CoA into HMG-CoA. The conversion of HMG-CoA into mevalonate is catalyzed by HMG-CoA reductase and this represents the rate-controlling step of the cholesterol biosynthesis. This enzyme is localized to the endoplasmic membrane and because of its controls the rate-limiting step of cholesterol biosynthesis, HMG-CoA reductase is also a key drug target for cholesterol-lowering medicines such as statins (2). These function as competitive inhibitors of HMG-CoA reductase. Animal cells contain three ATP-dependent enzymes that convert mevalonate into isopentyl pyrophosphate (IPP). It’s believed that these sequential steps are catalyzed by cytosolic enzymes, although evidence has been presented indicating that in fact these reactions occur in peroxisomes (8). Next, squalene, a branched-chain intermediate of 30 carbons, is produced through sequential condensation of six IPP molecules. These reactions are catalyzed by cytosolic enzymes, while the final steps, that convert squalene into cholesterol, require enzymes associated with the endoplasmic membrane. Of these, the oxidation of squalene into 2,3-oxidosquale, the reaction catalyzed by SQLE, is of particular importance because it represents probably the second rate-limiting step in cholesterol biosynthesis and is therefore an attractive target for novel cholesterol-lowering drugs (2). The biochemical and structural properties of this enzyme are described below in more detail. Human squalene monooxygenase is a flavoenzyme of 574 residues with a molecular mass of about 64 kDa that catalyzes the stereospecific oxidation of squalene into 2,3-oxidosqualene (figure 3 adapted from 7). This represents an epoxidation and is fact the first oxygenation step of the cholesterol biosynthetic pathway in which one atom of molecular oxygen is incorporated into the substrate, while the other is reduced to water. Like other flavin-dependent monooxygenases, SQLE requires NADPH for full activity, although the enzyme does not bind NADPH directly and does not contain a cytochrome P450 cofactor. Instead, the electrons that are required for flavin reduction are transferred from NADPH via an external cytochrome P450 reductase to FAD. Based on these features, SQLE falls into group E of flavin-dependent monooxygenases (5). 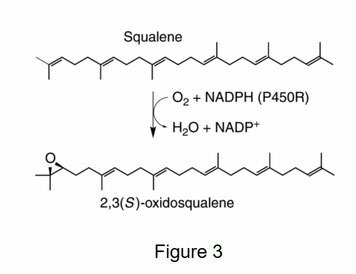 The oxidation of squalene is thought to be the second rate-limiting step in the biosynthesis of cholesterol. Consequently, it is tightly controlled both transcriptionally and post-translationally (2). SQLE activity was first described in rat liver microsomes in 1970 (9), while its full biochemical characterization and assessment of squalene oxidation was reported in the late 1990’s following the expression and purification of recombinant rat and human SQLE (10,11). Subsequently, homologous enzymes were discovered in fungi, plants and some bacteria, respectively. Considering its important role in cholesterol biosynthesis, cancer in humans and drug target, a deeper molecular understanding of SQLE is highly desired. With regards to this it should be noted that recently high-resolution structures of human SLE were presented with and without inhibitors at 3 and 2.5Å, respectively (7). In order to facilitate crystallization, a truncated variant was used comprising (residue 121-574) the central catalytic domain and the C-terminal membrane associated helices but lacking the N-terminal membrane spanning region. 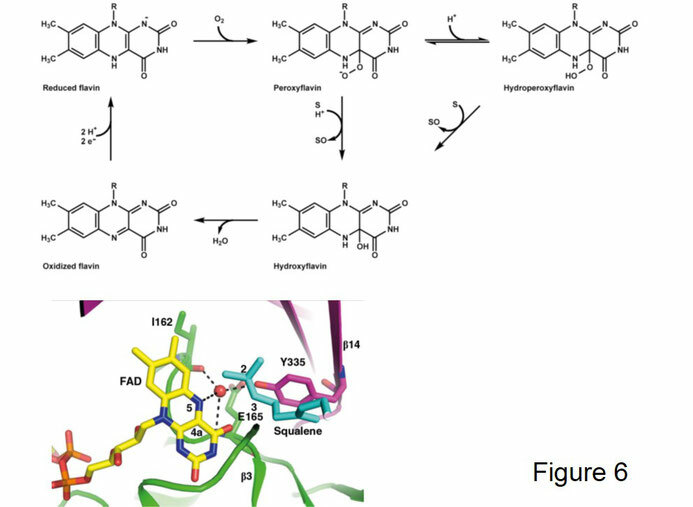 Structures were obtained with potent two small molecule inhibitors, namely: NB-598 (upper right panel of figure 4) and compound-4. The structure of human SQLE containing FAD and NB-598 is presented in figure 4 with FAD shown in yellow and NB-598 in green. Overall (upper left panel of figure 4), the catalytic part of the enzyme is made up two domains e.g. FAD-binding (in red) and substrate-binding (in magenta) domain that are connected to a helical C-terminal membrane associated region (in grey). The FAD-binding domain comprises a three-layer ββα sandwich fold, while the substrate-binding domain is organized into a two-layer βα sandwich made up of 7 stranded β sheets and two helices that adopts an extended conformation with an opening towards FAD. Furthermore, the structure shows that NB-598 is observed within the substrate-binding domain with the actual substrate-binding site located at the interfaces of the FAD-binding domain, substrate-binding domain and C-terminal membrane associated region. A close-up of the substrate-binding site is provided in the bottom panel of figure 4 and reveals that NB-598 (in green) is primarily surrounded by non-polar residues. These make up the substrate-binding site and include: Pro415, Leu469, Leu473, Phe477, Leu519, Phe523, Val526, His522, Phe495, Ile208, Tyr195, Ala322, Phe166 and Tyr335. Moreover, the structure of the enzyme only in complex with FAD was also solved. A structural comparison of the unliganded enzyme (in green) and bound to NB-598 (in orange) is presented in the top panel of figure 5 with FAD in yellow and the inhibitor in blue. This shows that the unliganded enzyme is folded into an overall structure that is similar to one of the inhibitor-containing enzyme, thereby indicating that binding of inhibitors and substrates does not result in major structural rearrangements. 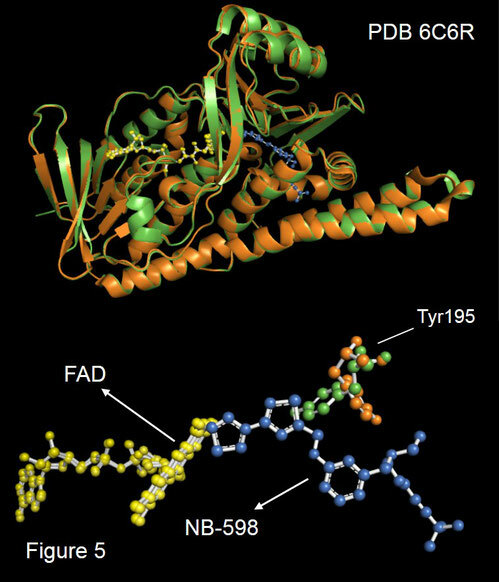 However, a close up of the substrate-binding site (bottom panel of figure 5) reveals that in the unliganded enzyme Tyr195 is pointed away from NB-598, while in the inhibitor-containing structure this residue interacts with it. The importance of Tyr195 was probed by replacing it with either Phe or Ala. This abolished enzymatic activity, demonstrating that the interaction between Tyr195 and substrate is functionally important. Unfortunately, attempts to cocrystalize squalene were unsuccessful and therefore this compound was modeled into the substrate-binding domain of the unliganded enzyme through molecular docking. This revealed that squalene interacts with the same residues as NB-598, confirming that these residues indeed make up the pocket for substrate binding. The reaction catalyzed by SQLE is highly specific and involves insertion of an oxygen atom next to a carbon-carbon double bond to form an epoxide (2). To this end, the flavin of monooxygenases is typically first reduced by addition of electrons that are donated by NAD(P)H (top panel of figure 6 adapted from 5). Subsequently, reduced flavin reacts with oxygen which generates C4a-(hydro)peroxyflavin at the N5 position of the flavin ring. This represents a reactive intermediate formed by a covalent bond between molecular oxygen and C4a of the flavin. This peroxy species reacts with organic substrate molecules thereby splitting the oxygen-oxygen bond and inserting one oxygen atom into the substrate as an epoxide. In addition to forming an epoxide, a C4a-hydroxyflavin is produced, that, in the last step is reoxidized, thereby releasing water and the epoxide product from the active site. In the absence of a suitable substrate, the C4a-(hydro)peroxyflavin decays to oxidized flavin, yielding H2O2 as product. SQLE probably also employs this catalytic mechanism but it differs from other flavin monooxygenases in several ways, namely: (1) it introduces an epoxide instead of a more commonly observed hydroxyl group, (2) it contains loosely bound FAD and (3) electrons are donated from NADPH through a cytochrome P450 reductase rather than binding NADPH directly. Mechanistically, this means that binding of reduced flavin by SQLE is followed by interaction with oxygen to produce the C4a-(hydro)peroxyflavin. The N5-C4a region of the flavin ring is crucial for controlling oxygen transfer (12) and based on the structures discussed above it seems that Tyr335 (bottom panel of figure 6 adapted from 6) interacts with N5 of the flavin ring to stabilize the (hydro)peroxyflavin, thereby maintaining catalytic efficiency. Moreover, modelling of squalene into the active site revealed that its 2,3-vinyl group is close to the business end, N5-C4a region, of the flavin ring, which is consistent with regiospecific oxidation into 2,3(S)-oxidosqualene. Cholesterol and its derivatives are known as sterols and in fact cholesterol is the major sterol in animal tissues. Despite its association with cardiovascular diseases, cholesterol should not be viewed as a bad molecule because life would not be possible without this molecule. This because cholesterol is important for the structural organization of the lipid bilayer and it serves as precursor for steroid hormones, bile acids and fat-soluble vitamins. Moreover, cholesterol modulates the function of receptors involved in vesicle trafficking. Cholesterol can either be obtained from food or synthesized de novo. The biosynthesis of cholesterol requires about 20 enzymes of which some are located in the cytosol and others in the endoplasmic membrane. The cholesterol biosynthetic pathway is controlled at two different steps. Firstly, at the stage of HMG-CoA reductase. This enzyme catalyzes the conversion of HMG-CoA into mevalonate this reaction represents the rate-controlling step of the cholesterol biosynthesis. Therefore, HMG-CoA reductase is also a key drug target for cholesterol-lowering medicines such as statins (2). Secondly, at the stage of SQLE. This enzyme catalyzes the stereospecific conversion of squalene into 2,3-oxidosqualene (4). This is the first oxygenation step in the cholesterol biosynthesis and is probably the second rate-limiting step in this process. SQLE is a flavin-dependent monooxygenase that requires NADPH and oxygen to oxidize squalene (5). Importantly, this enzyme is of great pharmaceutical relevance because it is an attractive drug target for antifungal compounds and, moreover, accumulating evidence indicates a role as oncogene in cancer progression and aggressiveness in humans (6). It can therefore be expected that the recently solved structures of human SQLE will further our mechanistic insight and contribute to the design of novel inhibitors. 1. Molecular Cell Biology, 4th edition. New York: W. H. Freeman; 2000. 2. Cerqueira NM, Oliveira EF, Gesto DS, Santos-Martins D, Moreira C, Moorthy HN, Ramos MJ1, Fernandes PA. 2016. 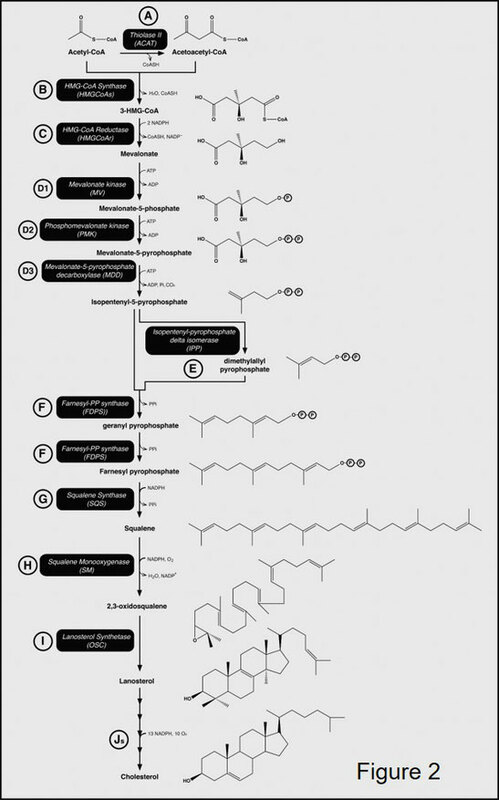 Cholesterol Biosynthesis: A Mechanistic Overview. Biochemistry. 55:5483-5506. 3. Rader DJ, Hovingh GK. 2014. HDL and cardiovascular disease. Lancet. 384:618-625. 4. Lienhart WD, Gudipati V, Macheroux P. 2013. The human flavoproteome. Arch Biochem Biophys. 535:150-162. 5. Huijbers MM, Montersino S, Westphal AH, Tischler D, van Berkel WJ. 2014. Flavin dependent monooxygenases. Arch Biochem Biophys. 544:2-17. 6. Cirmena G, Franceschelli P, Isnaldi E, Ferrando L, De Mariano M, Ballestrero A, Zoppoli G. 2018. Squalene epoxidase as a promising metabolic target in cancer treatment. Cancer Lett. 425:13-20. 7. Padyana AK, Gross S, Jin L, Cianchetta G, Narayanaswamy R, Wang F, Wang R, Fang C, Lv X, Biller SA, Dang L, Mahoney CE, Nagaraja N, Pirman D, Sui Z, Popovici-Muller J, Smolen GA. 2019. Structure and inhibition mechanism of the catalytic domain of human squalene epoxidase. Nat Commun. 10(1):97. 8. Kovacs WJ, Olivier LM, Krisans SK. 2002. Central role of peroxisomes in isoprenoid biosynthesis. Prog Lipid Res. 41:369-391. 9. Yamamoto S, Bloch K. 1970. Studies on squalene epoxidase of rat liver. J Biol Chem. 245:1670-1674. 10. Nagumo A, Kamei T, Sakakibara J, Ono T. 1995. Purification and characterization of recombinant squalene epoxidase. J Lipid Res. 1995 36:1489-1497. 11. Laden BP, Tang Y, Porter TD. 2000. Cloning, heterologous expression, and enzymological characterization of human squalene monooxygenase. Arch Biochem Biophys. 374:381-388. 12. Romero E, Gómez Castellanos JR, Gadda G, Fraaije MW, Mattevi A. 2018. Same Substrate, Many Reactions: Oxygen Activation in Flavoenzymes. Chem Rev. 118:1742-1769.